1. 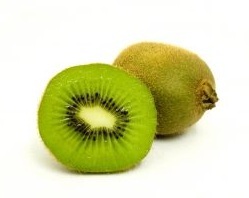 Vitamin C contained in kiwi boost immunity to a powerful protection against flu and colds. 2. Contains vitamin E three times more than apple, protect you against free radicals through antioxidant content efficacy. 3. Rich in fiber equivalent to three sticks of celery, paved the digestive system and bowel routines. 4. Kiwi fruit also contains folic four times more than peaches, this folic acid much-needed before and during pregnancy, beneficial for brain development of children, kiwi is also useful for healthy skin and blood cells. 5. Contains potassium equivalent mangoes, reduce high blood pressure and help regeneration of nerve and muscle.